Similar to other aggregators, Google brings together job postings from across the web, whether they're on websites run by small businesses or job boards with thousands of listings. This helps job seekers easily find advertised vacancies directly in Google Search. By posting to Google for Jobs via idibu, you ensure that your job adverts can be found even easier and faster by job seekers around the world! How do I post there? First, you need to add Google for Jobs as a posting destination on idibu - simply follow this article. You don't even need to enter any login information - none is required! 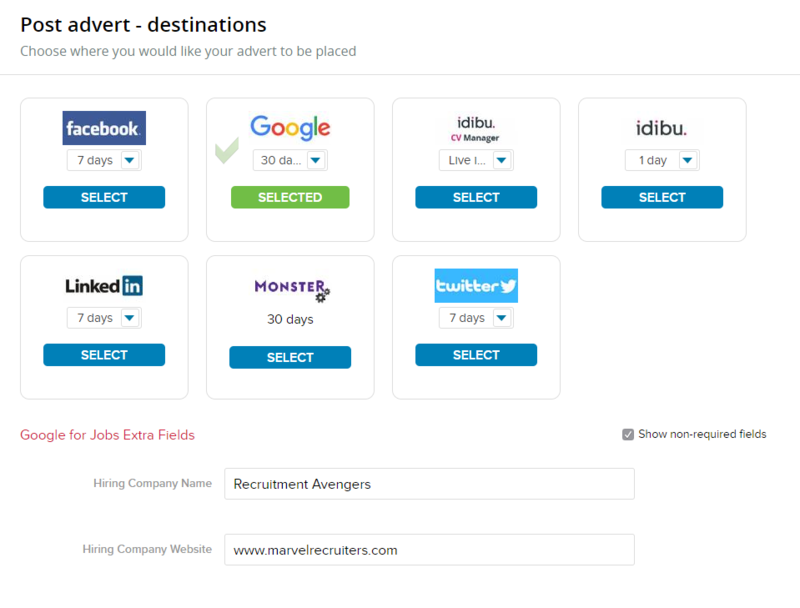 Afterward, you can post to Google the way you would do to any other website (consult this article for basic instructions about posting jobs via idibu via our stand alone system, or here for posting from inside your CRM). 2. You can then complete the 'Hiring Company Name' and 'Hiring Company Website' fields with those of your client. All your adverts posted on Google for Jobs will create pages on www.aptrack.co domain; our systems communicate with Google automatically to expose those pages to their search engine. What do the postings look like? 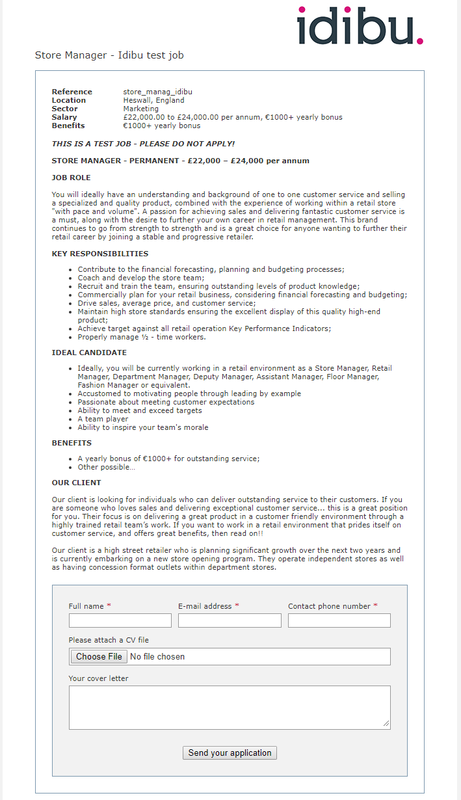 This Aptrack page can also be viewed straight inside your Adverts tab, simply by clicking the "view" button next to 'Google jobs' in the advert listing. I can't find my job posted via www.aptrack.co to Google - why is it? Although usually, it shouldn't be more than just a few minutes, it can take up to a couple of hours for a job to be fully indexed and accepted by Google; if you're not seeing your job right away, give it some more time! 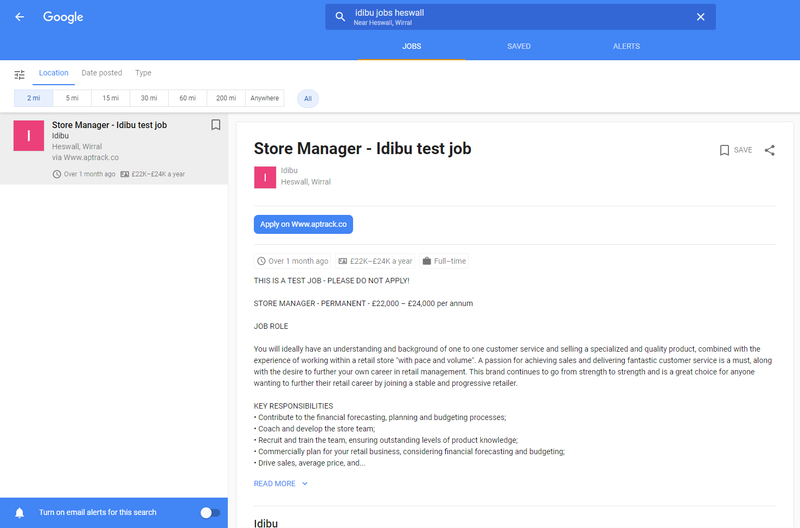 Idibu's pages are not the only ones from where Google obtains job ads - your advert may already have been indexed from a lot of other job boards (after all, you're using multiposting to get it out there! ), and Google uses very advanced duplicate detection algorithms to make sure that one and the same opening doesn't appear more than once in the results. Google's job search is not yet available in all countries - you can find the current region availability here. If you live outside those regions, the enriched search will not even work for you; it's also unlikely that you will get any applicants from outside those regions through Google directly for now. If you haven't already (most likely for social media posting), please contact support@idibu.com to set up your company's logo on www.aptrack.co pages - otherwise, Google's logo will show on your pages, which might be misleading for candidates!